Preheat oven to 180°C/350°F. Spread almonds on an oven tray and roast, stirring occasionally, until golden (5-6 minutes). Cool completely, then coarsely chop and set aside. Beat butter, icing sugar, vanilla and rosewater in an electric mixer until creamy. Beat in the yolk, then Amaretto, occasionally scraping down sides of bowl. Sift in flour, baking powder and salt, add almonds and stir to form a stiff dough, then turn onto a lightly floured surface. Shape into a disc, wrap in plastic wrap and refrigerate for 2 hours. Preheat oven to 180°C/350°F. Line two large baking sheets with baking paper. Roll out dough between two pieces of lightly floured baking paper to 1.5cm-thick. Cut into your desired shape using any 5cm (2in) diameter cutter and place onto prepared sheets. Reroll scraps once. Bake until light golden on the edges (18-20 minutes), cool on sheets for 5 minutes, then sprinkle with rosewater. Carefully roll the warm cookies in the icing sugar, then cool over a wire rack. Cookies will keep, stored in an airtight container, for 1 week (dust with icing sugar between layers). 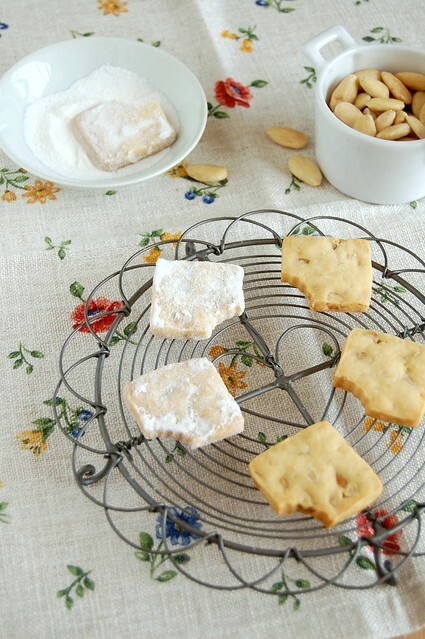 You are very creative making your shortbreads with a little "bite" at their edges. I hate rolling out cookies! Great to know I am not alone! And the comment about why to put almonds in these cracked me up! They look delicious! Amaretto butter cakes + "Argo"